A piece of jewellery which a woman wears around her neck. 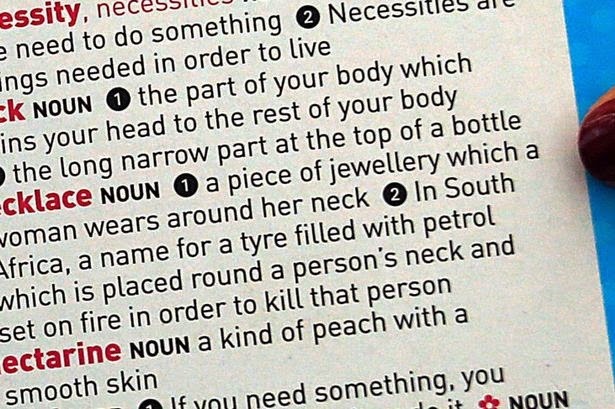 In South Africa, a name for a tyre filled with petrol which is placed round a person’s neck and set on fire in order to kill that person. Haha... Haven't heard of this story. Very funny! I can't believe dictionary now have Hello Kitty cover. I guess you gotta do whatever you can to make them sell. Right? I heard about it from my colleague who had sent me the whole news article. I don't know how and why Harper Collins could adopt Hello Kitty as their dictionary's cover. But I believe most kids love it. After the incident, this dictionary has stopped for sale. Not sure what Harper Collins is going to do next.